You’ll be hard pressed to find a more complete team building workshop than Putt Putt Pantry! With its perfect blend of charitable aspects and challenging skill development activities carried out in the most enjoyable, stress-free environment, it’s everything your team needs to make serious inroads towards positive change. 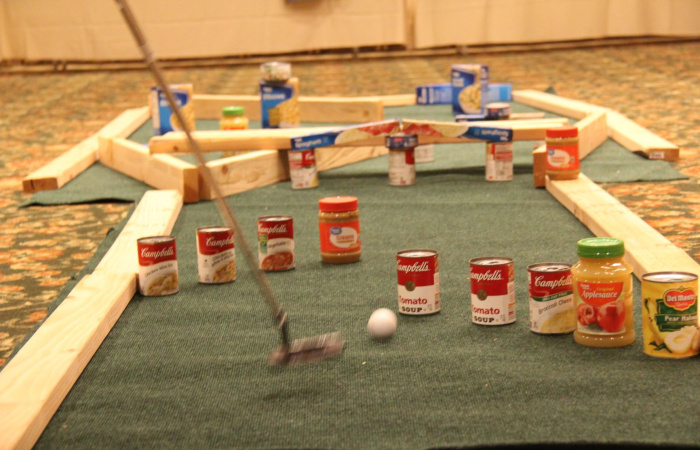 Putt Putt Pantry brings teams together to envision, create, organize and carry out a group project whose result will be donations of non-perishable food items to local food banks. It’s a hefty challenge, but we know your team is up to it! Besides, our professional facilitators know just how to get things rolling and engage everyone in all the hands-on activities. Everyone contributes, and that’s part of the “lesson” in Putt Putt Pantry. Teams learn that when everyone pitches in with ideas on a group project, success is even more attainable. What Exactly is Putt Putt Pantry? Teams will be asked to design a mini golf course: that’s the envisioning part. Then, they’ll be tasked with organizing themselves to move from the creative process of designing their golf courses to the more practical realm of building them. There are many steps along the way before a complete course can be tested. Here’s the twist: the building blocks of the mini golf courses are actual non-perishable food items like boxed foods, canned foods, etc. That’s where teams must get a little creative! It’s Hole in One for Everyone! You win because you commit your team to working together in new, better ways. Your team members win because they learn valuable workplace skills and gain personal insight. Everyone wins because your company has fulfilled some of its corporate social responsibility and helped a local food pantry.